Hell on the High Seas! Captain Torius Vin has given up the pirate life in order to bring freedom to others. Along with his loyal crew and Celeste, the ship's snake-bodied navigator and Torius's one true love, the captain of the Stargazer uses a lifetime of piratical tricks to capture slave galleys and set the prisoners free. But when the crew's old friend and secret agent Vreva Jhafe uncovers rumors of a terrifying new magical weapon in devil-ruled Cheliax—one capable of wiping the abolitionist nation of Andoran off the map—will even their combined forces be enough to stop a navy backed by Hell itself? From award-winning novelist Chris A. Jackson comes a tale of magic, mayhem, and nautical adventure, set in the vibrant world of the Pathfinder Roleplaying Game. 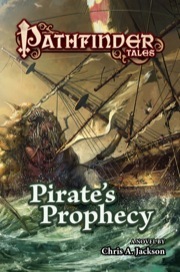 Pirate's Prophecy is sanctioned for use in Pathfinder Society Roleplaying Guild. Another great entry in this series, and like the previous book, it builds logically on that which came before. The stakes continue to rise, as does the tension (though the 2nd book had that in spades!). It's not just the main (3) characters that are interesting, though, but the supporting cast is pretty cool too (who wouldn't love Snick?!). Plenty of intrigue, espionage, and high-seas drama. An interesting development was w/ Celeste, who became an unwitting (won't spoil it)...let's just say her capabilities grew w/ her newfound abilities. But the fact that it was unwitting and even unwanted was a cool twist. Editing the same as the last 2 novels in the series. This novel was better than any action movie. Pirate's Honor pulled me into the relationships, Pirates Honor had me worried about the character's fates, and Pirates Prophecy had me jumping out of my seat and hoping everything would be ok. This book was amazing and I have to give the author credit for doing such a good job integrating game mechanics into the novel without it feeling forced. I loved it! this book had some real high points, namely with the dark horse protagonist Vreva, but it ends abruptly and feels anticlimactic, without much closure. it honestly feels like there was a ton of material just chopped off to make it fit, leaving me more frustrated than satisfied. I love how the Pirate's series has grown. Pirate's Prophecy builds on the previous two novels to give us a story of proxy war political maneuvers and Golarion style super-weapons that does not disappoint. I'm just holding onto that last star because I wanted to know more about Yami. Announced! Product description and image are final. Pirate's Honor had been sitting on my shelf for several months and after finishing it a week ago I feel foolish for waiting that long. Definitely a cast of characters I can't wait to see in another adventure. I have only read a handful of the pathfinder novels so far, but this series is definitely my favorite. Excited to for the news of the next entry. Just finished Pirates Promise this week. Looking forward to the next one. Reading these novels reminds me of how much fun the Skull and Shackles adventure path was! I love these novels. Can't wait for more Vreva Jhafe. Well you can read the next book Pirate's Promise. I've really enjoyed the Torius books, and looking forward to the next. Is it just me, or has the scale of what's at stake been going up a bit lately in the novel line? I met Mr. Jackson last year at Dragoncon and he was a real pleasure to chat with. Can not wait to read this latest chapter in the series. Wonderful, just finished Pirate's Promise, and can't wait to read this! I hope I finish Bloodbound before this arrives or I might have to switch over. This series has been enjoyable. Definitely on par with Dave Gross and Howard Andrew Jones entries. Any idea when the Audiobook for this will become available? The audio is now available, and the sample is quite nice! Steve West does Torius Vin, doing an Thuvian accent! Sweet!